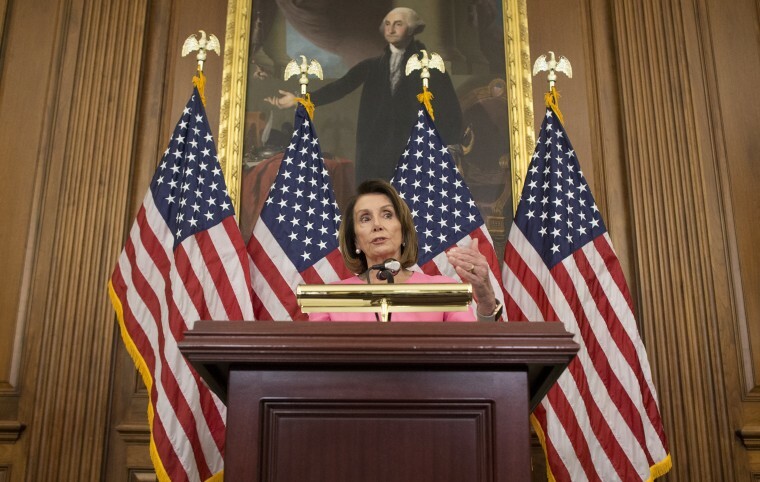 “I intend to win the speakership with Democratic votes,” Pelosi said Thursday. “I have overwhelming support in my caucus to be speaker of the House." WASHINGTON — House Minority Leader Nancy Pelosi, D-Calif., on Thursday dismissed the threat of a small but potentially growing insurgency within the Democratic caucus against her bid for speaker, expressing confidence that she had the support necessary to claim the gavel. At her weekly press conference, Pelosi, who served as speaker the last time Democrats controlled the House, from 2007 to 2011, anticipated the swarm of questions about the party's leadership elections. “Just pop ‘em out. Pop ‘em out,” she told reporters. Pelosi was asked about a rumored letter floating around Capitol Hill signed by 17 House Democrats in which they wrote that they would not support her bid for speaker, and why she still continues to express total confidence in her prospects of victory. Asked if she would ever accept Republican help to win the gavel, Pelosi rejected that idea, saying, “Oh please — never, never” and she said that if the speakership election were held on the floor today she said that she would have the votes to win. Rep. Marcia Fudge, D-Ohio, a former chairwoman of the Congressional Black Caucus, said Wednesday that she is considering challenging Pelosi for speaker. “Come on in, the water’s warm,” Pelosi said when asked about Fudge mulling jumping into the race. After a closed-door House Democratic Caucus meeting Wednesday, Fudge told reporters that she thinks they need a leadership change. House Democrats plan to hold leadership elections for the new Congress the week after Thanksgiving, on Nov. 28 and 29, and then hold the formal floor vote on the speakership when lawmakers return to Washington in early January.